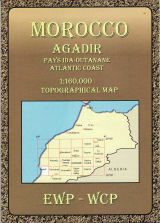 Full colour topographical map covering the Agadir, Pays Ida-Outanane, Souss-Massa Reserve and neighbouring Atlantic coastal regions. Tourist information covering access, main features, trails and glossary. Text in French and English. Inset overview map.